Magical sewing skills! | Sew Lindsay, Sew! 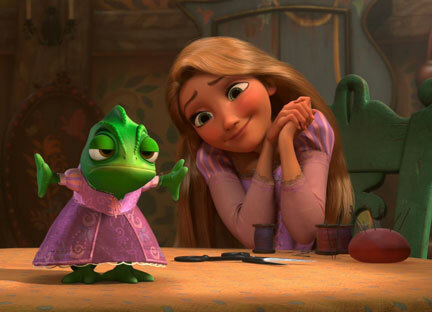 Disney’s newest heroine, Rapunzel, from the phenomenal film Tangled knows how to sew! Okay, so sewing wasn’t a huge focus in the movie or anything, but I was humored to see it represented at all. Not to mention, the screenshot above is simultaneously hilarious and adorable. Apparently Cinderella had some sewing know-how, as she was seen reading a dress pattern. However, it seems that the birds and mice really did most of the work, so Cinderella’s actual skills are debatable. Hmm, any others that I missed?